According to India's first-ever adult tobacco survey, about 33% Indian adults fall into the category of smoking & chewing tobacco. At least one in three adults used to smoke or chew tobacco in India. The survey conducted jointly by CDC Atlanta, IIPS Mumbai, WHO & the Union health ministry found that women smokers occupies the top position than men in India. However, the use of tobacco is higher in men than women. 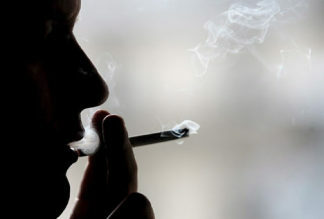 The research indicated that around 196 million men & 77 million women are tobacco users in India. While northern India comes with the least number of female tobacco users, eastern India leads the pack. According to the World Health Organization (WHO), about one billion women are smokers in the world. Both men & women who smoke are prone to cancer, heart disease & respiratory disease. The survey found that teenagers between 15 & 17 years age buy tobacco from stores & 3 in 10 adults are exposed to second-hand tobacco smoke in India. Even though, Tobacco cultivation provides livelihood to millions of Indian people that creates health hazards, the health ministry is seeking alternative crops for tobacco farmers, said Health minister Ghulam Nabi Azad.